Here's a police car that stops traffic even when it's parked, but if you're speeding in Bear Valley, California, don't be surprised if its unmistakable grill appears in your rear view mirror. It happened recently to a Corvette that chanced to pass by when Chief Marcel Jojola was showing the 1958 Edsel Ranger off to videographers from CNN. "We pulled the 'Vette over, much to the driver's surprise," he laughed. 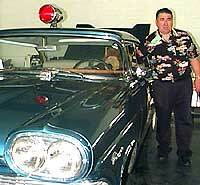 An Edsel, after all, is an unusual sight under ordinary circumstances, but an Edsel squad car is rare indeed. Chief Jojola, who has directed the Bear Valley Metro Police Department for the last fourteen years, explained that while Edsels were never common as police cars, they were nonetheless used by departments all over the country during the years Ford produced them: 1958-1960. "Probably about 900 Edsels were used as police cars during those years," said Jojola. "That surprises a lot of people." "I found this car in New Mexico," he said. "It was originally in service in Minnesota, and when I got it, it hadn't been driven for seventeen years." Jojola restored the car, and it has been an official police vehicle in Bear Valley since 1997. "We use it primarily for community outreach," said the Chief, "But it's a real police car. We used it once in a drug raid." The car has also appeared in movies, and it's well known among Bear Valley's childen. "Whenever kids tour the department," said Jojola, "They always want to see 'the old car.'" Recently, Chief Jojola drove his vintage squad car to Las Vegas for an Edsel rally that drew cars from all over the West. Not surprisingly, it was the car with the red light and siren on the roof that attracted the most attention. For more info and pictures of other noteworthy Edsels, click here. Robert Beyer, an active member of the Southlanders Edsel Club, graciously alerted us to an error we made in the initial posting of our story about Chief Jojola's Edsel Ranger. Somehow, we inadvertently identified Chief Jojola's vehicle model as a "Rambler" which, as we should have known, was produced by AMC, not Ford. Beyer's Edsel Bermuda station wagon, pictured here at a Reno car show, is equipped with original low gearing ("towing option") which enables it to easily conquer 8000-foot Sierra Nevada mountain passes. En route to Reno, Nevada, from his home in Tehachapi, California, Robert traveled on Route 88, which goes through the famous California gold country and connects with US Highway 395 near Minden, Nevada. Beyer reports that the engine has a few new parts including fuel, water, and oil pumps, but it's still the original 361 E400 engine and has yet to be rebuilt. 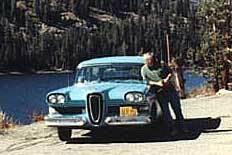 Next time you're camping in the Sierras, don't be surprised if there's a blue Edsel in the campsite next door!